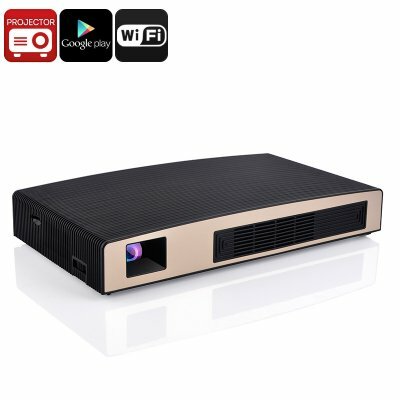 Successfully Added Smart DLP LED WiFi Projector - 180Lumen, Android OS, MSTAR638 CPU, Wi-Fi, Bluetooth, Google Play, Airplay, Happycast to your Shopping Cart. This DLP projector is like having a portable cinema, featuring a project image size up to 200 inches, automatic keystone correction and awesome connectivity you can share photos, watch movies, play games, make presentations and surf the web on a giant screen. The projection method makes use of Texas Instruments DLP technology that provides 16.7 million colors, 256 gray scales, and an impressive 854*480 native resolution. It can handle 4K and 1080P video files and the LED lamp will last you about 20000 hours. With a 180lumnes your enjoy a clear crisp and bright image. This portable home theater is one of the best on the market and comes with an Android operating system. This puts countless apps, movies and games at your fingertips and lets you take advantage of YouTube, Hulu, Netflix and more. It also benefits from wireless connectivity and has an 8400mAh battery which lets you enjoy up to 100 minutes of entertainment without the need for any electrical leads. The X2 mini projector comes with 12 months warranty, brought to you by the leader in electronic devices as well as wholesale audio visual gadgets..